(1) If there is an open circuit between a No. 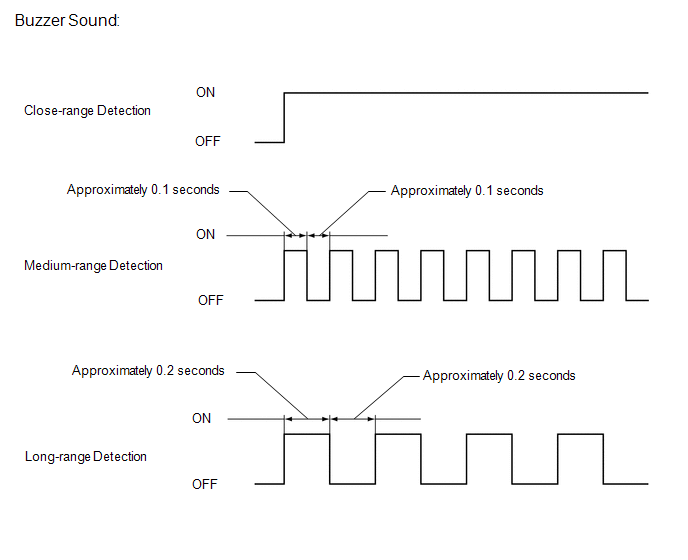 1 ultrasonic sensor and the clearance warning ECU assembly or a sensor is malfunctioning, the malfunction is displayed as shown in the illustration. 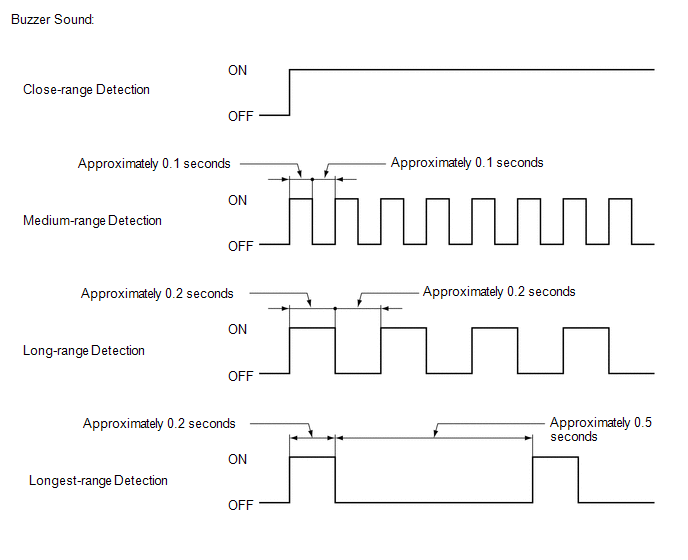 If a sensor has an open circuit, check for DTCs and troubleshoot according to each inspection procedure (See page ). (1) If a sensor is covered with foreign matter, such as mud or snow, the affected sensor is displayed as shown in the illustration. 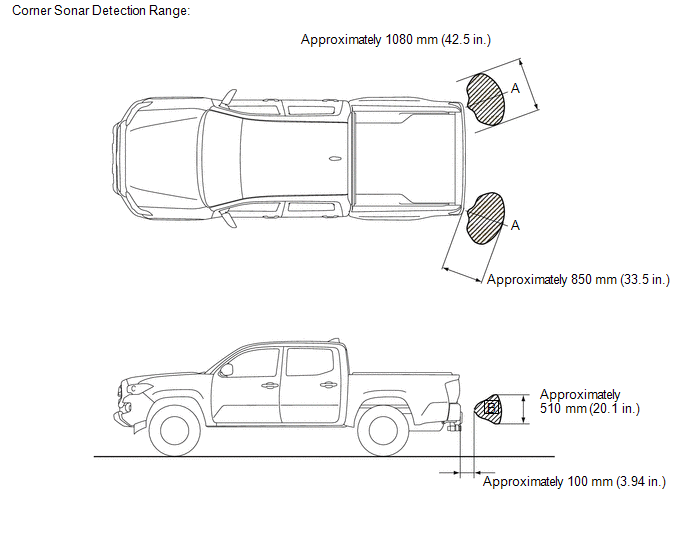 If a frozen indication is displayed, read Precaution for Intuitive Parking Assist System first and confirm that the sensor is not covered with foreign matter (See page ). Check for DTCs and troubleshoot according to each inspection procedure after confirming that the sensor is not covered with foreign matter (See page ). The following measurement and inspection will be performed with the shift lever in a position other than P. Be sure to apply the parking lever and depress the brake pedal firmly to prevent the vehicle from moving. (b) Turn the back sonar or clearance sonar switch assembly on. (1) Move the shift lever according to the table below. (2) Move a 60 mm (2.36 in.) diameter pole near each sensor to measure its detection range. 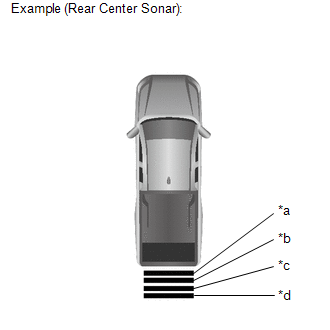 When measuring the longest-range detection of the front center sonar and the rear center sonar, use a wall or equivalent. The No. 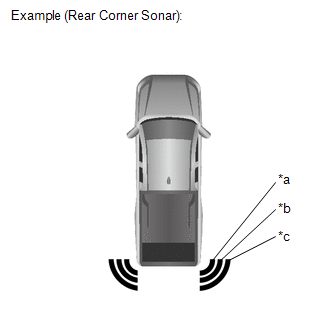 1 ultrasonic sensor side view detection range (hatched area labeled (B)) represents the cross section of the top view detection range (A). The hatched area (B) does not represent the entire side view detection range. (1) When the No. 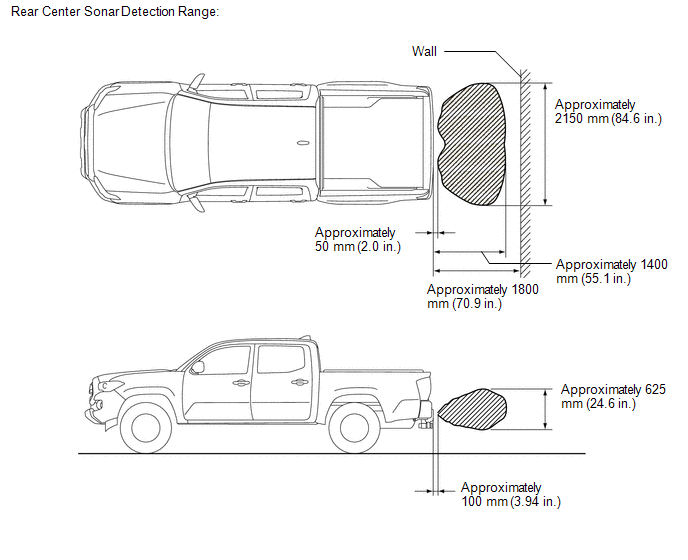 1 ultrasonic sensors (rear corner sonar) have detected an obstacle, check the display and check that the buzzer sounds. (1) When the No. 1 ultrasonic sensors (rear center sonar) have detected an obstacle, check the display and check that the buzzer sounds.